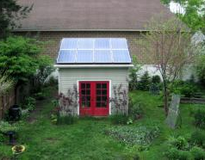 The whole installation was great – the inverter is in our basement and they were very respectful of our time and schedules. Three years into the lease and we are so happy we made the change. We converted to a tankless electric hot water heater which likely saved us at least $1,000 during winter 2013/2014 in oil we didn’t have to buy – and we still never exceeded what our electric costs were pre-solar. If others want to look into the tankless hot water heater, I would recommend doing a good deal of research first – many of the commercial brands have issues – we went with one from Stiebel Electron and have been very pleased with how it performs. The folks from Alteris were fantastic – we were the first solar installation in Rutland, MA – so the building and electrical inspectors had a lot of questions. The master electrician from Alteris was able to answer those questions and was happy to help ease any concerns about saftey. Kudos to the town inspectors as well for taking the time to ask the questions. There are now a number of installations in town.